It's very human to make mistakes. That's what proof reading and error checking are for. However, in the course of the conception, planning, and execution of this post I made such a large blunder - one so central to the conception of the piece - that I feel it will be more instructive, or at least more amusing, to make the blunder itself the subject of the post. Before you click away in disgust let me reassure you that the topic is whisky: old and interesting whisky. There will be tasting notes too. This is meant to be an instructive lesson; not simply a train wreck. But I'll let you be the judge of that. It all started in April when I wrote a review of Compass Box Hedonism - a blended grain whisky product of delicacy, grace, and a delicious and new flavor signature (for me). I decided to make it my business to try distinguished single grain whiskies. 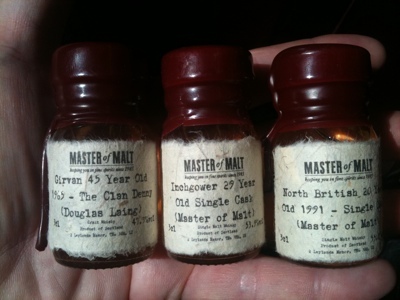 I was perusing the samples available at our friend's The Masters of Malt. I knew the names of some of the distillers of single grain whisky: North British, Girvan, Cameron Bridge, Strathclyde, and... and... Inchgower? ...Invergordon? I always get those confused. It's Invergordon. Inchgower is a malt distillery - not a grain distillery. It is the primary component in Bell's. I made this error explicitly on Twitter. I was discussing a particular old 1964 bottling of Invergordon from The Whisky Exchange. I referred to it as Inchgower in a tweet to Stuart Robson and Billy Abbot (@Cowfish) when the latter gently corrected me. As he did so a light went off. 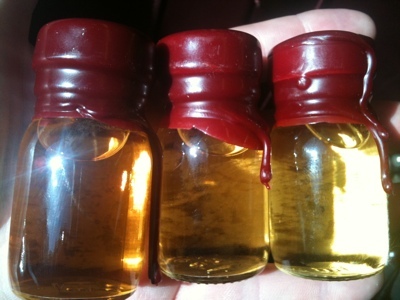 I had selected and purchased my three mature grain samples, tasted them and written notes and even tweeted some of the notes all without realizing that one of the specimens wasn't a grain whisky at all! Edinburgh’s last working distillery, widely known as ‘NB’. North British contributes to such top blends as: J&B, Famous Grouse, chives Regal, Lang's and Cutty Sark." Distilled on the 22nd January 1991. Aged in a first fill bourbon barrel. Bottled in March 2011. 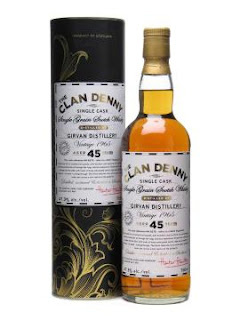 A single cask release of 244 bottles. Nose: cake batter, daisies, acetone, cocoa butter and a hint of savory. Palate: Sweet & light cocoa butter, bubble gum, cotton candy and a wonderful thread of very august and unusual blueberry fruit on the entry. A bright spirity expansion on mid-palate with tangerine notes and then a drying used up chewing gum feeling on the turn to the finish. The finish is fairly short and gentle - not really a problem. Lovely - particularly on the sweet candy opening. A splash of water opens things to an ethereally light sweets and blueberry & gum fruits flavor direction. There is a bit more oak in the end of the mid, but remarkably light and fruity. Delicious and borderline five stars. Distilled on the 30th June 1982. 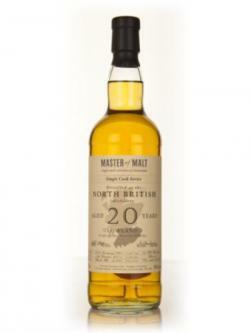 Aged in a single refill hogshead for 29 years before bottling on the 22nd November 2011. A release of just 190 numbered bottles, at natural cask strength. Nose: Cotton, linseed, apricots, faint acetone, some floral notes, but in the hazy distance - like wildflower meadows sniffed through an excellent linen suit. Nosing further I'm getting lemon with the apricot, natural painter's oils, and some noble rot rancio notes. It's very nice nose: distinctive and unique. Subtle, yet very involving. Palate: Floral sweet, tangy with rubarb and blueberry with a lacy floral delicate expansion into a more spirity mid palate with notes of toasted coconut and sweet dry hay. The fade sees a gentle herbal complexity replace the sweet and heat. 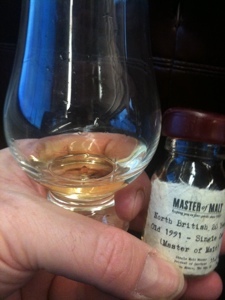 Very little wood, little tannin for such a mature dram. There's a ton of rich complexity in the opening and then a pretty dramatic contrast with a drier elegant mid and short turn to the finish. There's a long lingering afterglow aspect to the finish however, with a glow of sweet blueberries that fills me with an intoxicated infatuation however. This one elicits a powerfully loving emotional response in me. Grain whisky at Girvan is produced using a mix of 90% wheat and 10% malted barley. Palate: rich and spirity but sweet and complex with dried sultanas in grappa. Oily and dense with rancio and blueberry laced mint, cardamom pods and ivy. There are also hints of citrus. That's just the opening! The expansion brings spice and a bitter medicinal herbal aspect to the full palate of flavors carrying over from the openings. The finish is a slow gentle fade with most of the same flavors holding. A rich and august presentation. Flavor dense and sophisticated. Did you catch my error? Can you see why I might go the whole day - through the tastings and well after and have to be prompted by a friend before realizing that the Inchgower in question was a malt rather than a grain whisky? It seemed very much of a piece - down to the unusual blueberry noble rot flavor notes. Tasting the Inchgower after realizing my error I somehow wasn't getting toasted coconut anymore - I was getting toasted malt instead - modifying those distinctive and fairly unusual rubarb and blueberry flavor notes. What a lovely sweet and complex entry! This shift from toasted coconut to toasted malt is a pure example of expectation bias in action. When I thought it was grain I was wanting to taste coconuts. When I knew it was malt I wanted malt. What was I ACTUALLY tasting? Well tasting is a fusion of neural input and sensory input in the brain. So the answer is that expectation bias affects what you actually taste. Both sets of tasting notes are valid. Thus the power and need for tasting blind. I can see a clear argument for tasting blind every time. That doesn't mean I'm going to do it. The extra effort would be crippling for me in my current circumstances - but I will try to do so as often as I can. What does this tasting say about mature grains? Two isn't a definitive sampling - but I can state that these were delicious and that they have big openings and then fade from there - which is quite different than many malts which show a more dramatic evolution across the palate from opening to mid palate to finish. 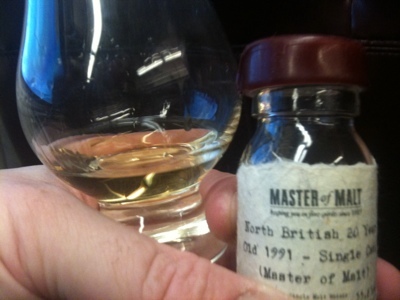 What does this tasting say about Compass Box Hedonism? Hedonism seems to be a vatting of grains in the 20s (maybe teens through thirties). I'll need a lot more experience before I could make anything close to an accurate guess. Hedonism has many of the flavors of the 20 year old North British but with a smoothness and integrated elegance quite unique all its own. I think this is the beginning of a beautiful relationship - with mature grain Scotch whiskies... and with error checking.